Members of PAC-Sindh are seen in the photograph taken during the inaugural meeting of The Provincial Advisory Committee of the Pakistan Poverty Alleviation Fund (PPAF) for the Sindh province. Karachi, October 10, 2018: The Provincial Advisory Committee of the Pakistan Poverty Alleviation Fund (PPAF) for the Sindh province, (PAC – Sindh), held its first meeting on Tuesday, October 9 in Karachi, introducing committee members from the provincial government, PPAF Board and experts from relevant sectors and academia. The first meeting laid the scope of engagement for the PAC – Sindh in relation to development needs of the province and PPAF’s priority thematic and geographic areas. This includes a focus on health and nutrition; water; education; and livelihoods and financial inclusion. 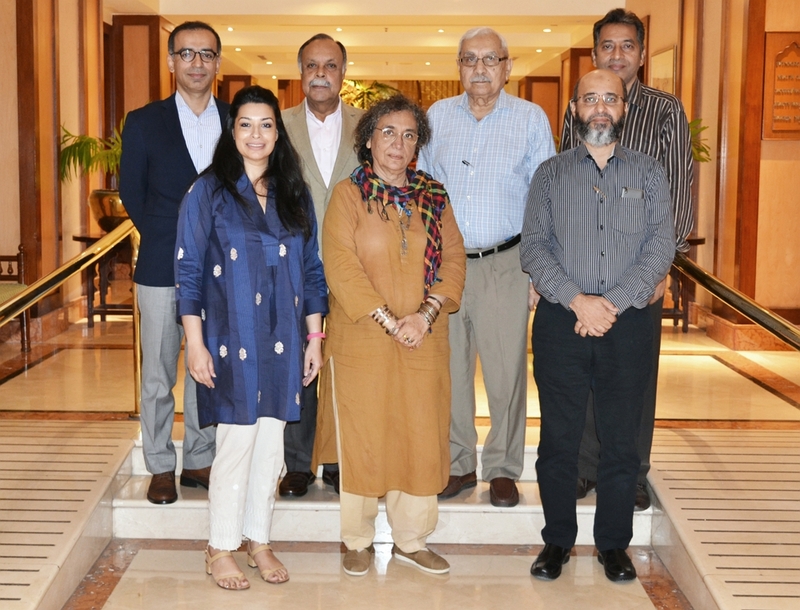 The PAC - Sindh, chaired by Director PPAF, Dr. Aijaz Ahmed Qureshi, includes Dr. Suleman Shaikh - Director PPAF and Secretary Board of Trustees, SZABIST, Karachi, Ms. Sadiqa Salahuddin - Member General Body PPAF and Executive Director - Indus Resource Center, as well as representatives from Planning & Development, Health and Social Welfare Departments, Govt. of Sindh. Civil society/private sector representatives include Mr. Fawad Soomro - Head, Engro Foundation, and Ms. Kausar S Khan - Head, Behavioral and Research Sciences, Aga Khan University Karachi, and PPAF’s Provincial Coordinator Ms. Samia Liaquat Ali Khan – Sr. Group Head, Quality Assurance & Research Design. . In his welcome note Chairman PAC-Sindh, Dr. Aijaz Ahmed Qureshi stressed on the dire need of poverty alleviation and explained that PPAF has undertaken the new PAC initiative to involve provincial government and civil society in the work in the province and to seek inputs from experts to create more meaningful impact in Sindh through direct programmes, collaborations and linkages. The initiative aims at enhancing coordination with the governments at the provincial level in the light of 18th amendment in the Constitution of Pakistan. The main session focused on the development context of the province. Ms. Samia Liaquat underscored PPAF’s role in countering development challenges in the past and highlighted the opportunities available to bridge the existing gaps for future policies. With a presence in 24 districts through 25 partner organizations, PPAF has a grassroots network of 31,033 community organizations, 3,495 village organizations and 111 local support organizations. A consultative workshop was held on the second day, comprising PPAF’s partner organizations and Karachi-based SUN-CSA members. With four thematic areas, the workshop called for developing sector strategies and priorities in health and nutrition, livelihoods and financial inclusion, education, and water.